This is a very nice PS2 controller. Feels really good in the hands and all the buttons, the directional pad, bumper buttons, and analog sticks function very well. There are no problems with the wireless connectivity so far. Fast and well-protected packaging from Lukie Games. Totally worth the money. I purchased one of these before from Lukie; worked great and I wanted another one for dual play. No problems and it works even if I am not directly in front of the PS2. Thanks! Great price, fast delivery, and works perfectly. They work great. Put in batteries, plug in, ready to go. I had no issues,came with directions and easy to follow. Pretty good controller. Works well, has a decent range for connectivity, and is really sturdy. Some downsides are that it lags at times, the buttons aren’t pressure sensitive and the analog sticks are too sensitive at times. For the most part, it’s a good controller for a good price, despite it’s flaws. Recommend for someone on a budget. This written review follows with my video review. The KMD brand is unknown but is a diamond in the rough when I went out on a limb for buying a controller to replace a new and bad yobo gamewear controller. When it arrived it was in adequate packaging it is plug and play (well it needs batteries first) It works like a good controller should. The sticks were loose enough to not require much breaking in and the L2 R2 triggers are the newer type and sadly not pressure sensitive. But work great. 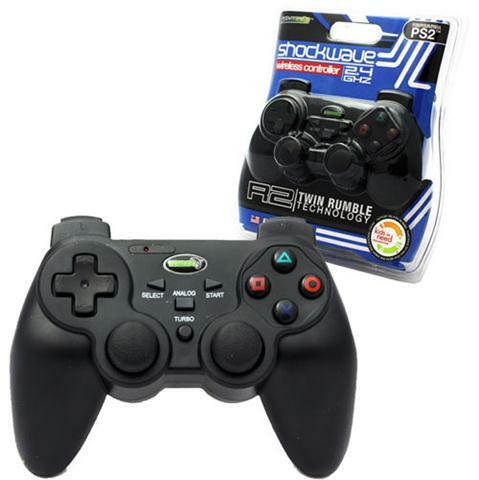 So if you want a new PS2 controller that is wireless give this one a shot because you will not be disappointed. I got 2 of this gamepad it's good not as high quality as the original PS2 gamepad but it's fairly good enough to work and function without the cords the price is a bargain if you like PS2 and need a wireless gamepad this is a good choice keep in mind though this gamepad uses 3 AAA batteries. It works great. I'm in love with this controller. Nice to play without cable. Received the controller and it works as described. Works perfectly great. Love playing with my kids! I do truly love these controllers. They make game time so much better. Also I love not tripping on cords. Love it!!! It's a good controller for the price. Somewhat of an odd feel but has perfect response. I especially like the PS3 style L2 & R2 buttons. Although there are some things that I don't like about it. The joysticks are more sensitive than a normal controller, but what I really don't get is that it uses triple A batteries when other off-brand wireless controllers use double A batteries. But I still recommend this controller so I'll rate it 4/5.